North-western Africa, satellite image. North is at top. 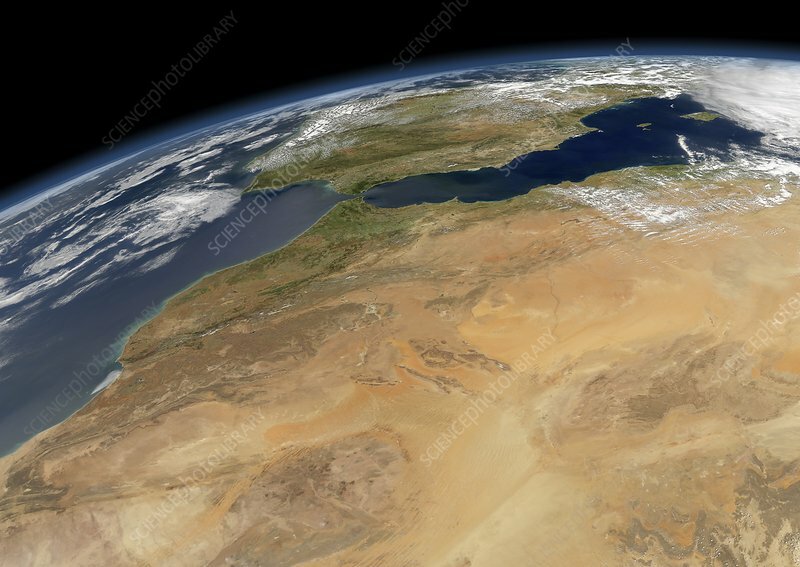 This north-western portion of Africa, over a thousand kilometres across, includes Morocco (left) and northern parts of Algeria. The terrain is dominated by the Sahara Desert, with vegetation restricted to coastal areas. The Straits of Gibraltar (upper left) separate Africa from Europe's Iberian Peninsula (top centre), and the western Mediterranean (upper right) from the North Atlantic (far left). Image data obtained on 31 March 2008, by the Moderate-resolution Imaging Spectroradiometer (MODIS) instrument on NASA's Aqua satellite, part of the Earth Observing System (EOS).